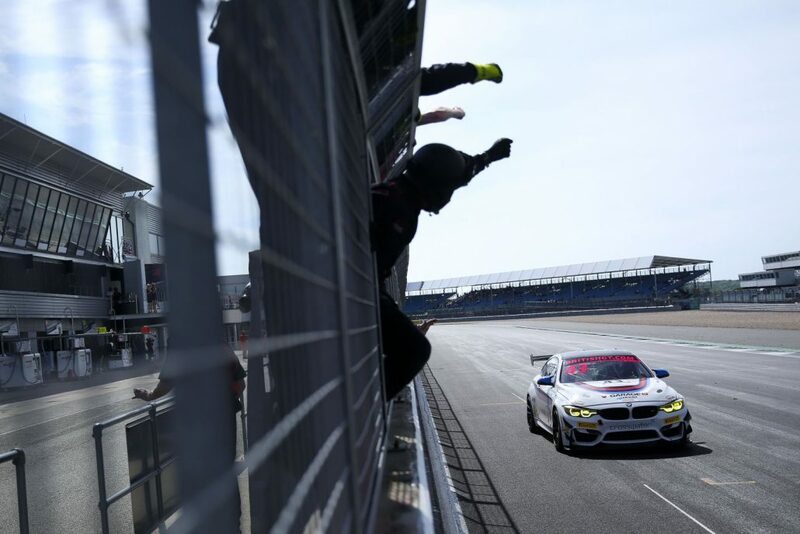 An absorbing GT4 race eventually went the way of Century’s Aleksander Schjerpen and Jack Mitchell who moved into contention before the final driver change and then benefitted from the team’s sister BMW serving a 20s success penalty for winning at Snetterton. Their victory also owed much to Equipe Verschuur’s bad luck, which saw pole-sitters Finlay Hutchison and Daniel Mckay retire with front suspension failure while leading by 35s at the start of the final hour. That handed Ben Green and Ben Tuck the lead after the duo had worked their way up from sixth on the grid. However, their advantage over team-mate Schjerpen – who fought back from 13th after the first 30 minutes – wasn’t enough to overturn the full pitstop success penalty, which dropped them to a net third at the start of the final stint. Meanwhile, late stops for Matthew George and Callum Pointon helped Mitchell inherit a 17s lead, which he extended by a further 10s over the closing stages thanks, partly, to setting a new GT4 lap record – 2m12.263s – and, with it, claiming the Sunoco Fastest Lap Award. Two of Tolman Motorsport’s three McLarens retired through separate incidents, but its third – shared by Jordan Albert and Lewis Proctor – was the model of consistency en route to second despite carrying a 15s success penalty. Proctor’s incredible start helped the #5 570S leap from seventh to first, which became second by the time Hutchison had recovered after a slow getaway. There they remained throughout the race despite the various strategies moving others ahead and then behind. Further back, the battle for the last step on the podium came down to the final laps. Tuck initially held the upper hand but eventually lost out to Matt Nicoll-Jones, whose Academy Motorsport Aston Martin he shares with Will Moore remained a top-five fixture all afternoon. Nicoll-Jones looked to have settled the matter with three laps to go, but the battle had also brought Patrik Matthiesen into play, and after the Dane dispatched Tuck at the same corner one lap later, the race was on for third. The HHC driver’s subsequent move at Luffield, which included contact with the Aston Martin, set up a grandstand run to the line. And although the Ginetta crossed it first, the positions were ultimately reversed post-race. Tuck and Green finished fifth, while Jan Jonck and Tom Wood’s retirement with just five minutes remaining helped UltraTek Racing RJN Motorsport’s Pro/Am winners Kelvin Fletcher and Martin Plowman complete the top-six. Fletcher’s performance in the opening stint against the Silver-graded drivers particularly caught the eye, while Plowman was as rapid as ever in his pursuit of sixth over the final hour. George and his Generation AMR co-driver James Holder led the Pro/Am class until a late drive-through penalty dropped their Aston Martin behind Plowman and Fletcher, but they still finished seventh overall on a one-off GT4 outing together. George was also scheduled to drive the #44 Invictus Games Racing Jaguar before Paul Vice retired from the race early. HHC’s second Ginetta of Will Burns and Mike Newbould, plus Team HARD’s two G55s, completed the top-10.